At our Kelowna skin clinic, we help patients address a wide range of skin issues. If you've ever experienced skin problems due to fabrics or jewelry, check out this post to learn how to style and accessorize worry-free. Have you ever got an adorable pendant or beautiful bracelet only to have it iturn your skin greenish? Do you find that newly-purchased garments irritate your skin? Here’s our rundown on choosing jewelry and fabrics that won't irritate your skin. It goes without saying that everything from your newly purchased silk dress to that amazing thrifted vintage jacket should be washed or dry-cleaned before you put it on. For any casual items you're washing at home, an extra rinse cycle definitely doesn’t hurt. The vast majority of clothes, whether designer or vintage, may be tried on by others in the store. This means that perfumes and skin products can be passed on, and more rarely, skin irritation or conditions can be passed from one person to another. Items such as denim are pre-washed with harsh detergents or additives. Some garments, such as “wrinkle-free” tops can contain agents such as formaldehyde. Leather goods may be treated with tanning agents, and require airing out or a dry cleaning for those with sensitive skin. If your skin is still irritated by a garment after a wash or dry-clean, it may be that you are sensitive to the fabric itself. For example, some individuals may also have a sensitivity to polyester. or scratchy fabrics such as rugged wool or denim. If you're sensitive to a specific fabric, it is best to avoid them altogether or wear items layered over other items. Others may have a latex allergy. In this case, it might be wise to avoid clothing with any sort of exposed elastic band. Additionally, many tight-fitting fabrics can cause irritation during the summer months, when the weather is particularly hot. That’s why the summer is a great time to opt for loose-fitting garments. The team at our Kelowna skin clinic always recommends you visit a doctor if irritation persists or worsens even when you stop using the irritating garments, or if you experience a rash or other changes to your skin. 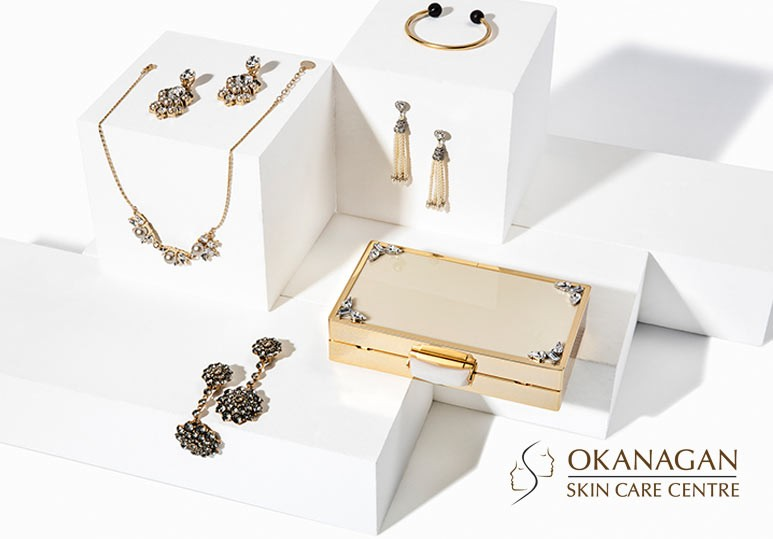 The most well-known reason for skin irritation caused by jewellery is the type of metal. Some costume jewellery pieces will be made of metals such as nickel to keep the cost down, while other times an irritating metal will be used as an alloy in a gold or silver piece, in order to make it stronger or improve the look of it. Did you know that 5% -10% of individuals have a nickel allergy? Additionally, some dermatologists note that it’s possible to develop a nickel allergy with continued exposure to the substance. Copper is another skin-irritation culprit. When this metal--usually employed in alloys--oxidizes, it discolours the skin. This allergy is less common, but if you notice any of the following metals causing irritation to your skin, you may have a sensitivity to copper. If you are highly sensitive to copper, sterling silver (92.5% silver alloyed with copper) might not be for you. Copper is also contained in rose gold. Copper is also a component in brass. When it comes to fine jewellery, stick to high-karat gold jewellery, or platinum options. For budget-friendly fine jewellery options, palladium can be a great choice. For casual wear, seek out the words “hypoallergenic” or “surgical”. If you don’t mind switching up your look, might also have luck seeking out alternative materials. Try pieces that use semi-precious stones as focal points, and cotton or leather string instead of chains. If you do opt for plated jewellery, ensure that you know what the base metal is. It could cause skin sensitivity if it is nickel, copper, or bass. Ensure that you have your jewellery re-plated often. Sometimes, you may notice a ring or bracelet causing irritation. If you don’t have a metal allergy, or if the item doesn’t contain any of the metals above, it’s possible that the irritation may be caused by sweat between the item and your skin, or a fit that’s too tight and causing chafing. These issues can be solved by periodically removing and washing your jewellery (even wedding rings), as well as always having your jewellery professionally sized. Our Kelowna skin clinic is happy to meet all of your skincare needs! Whether you’re looking for a procedure, a product, or a general skin analysis, don’t hesitate to give our team a call. You can reach us at 250-868-9290, or through our online contact form.